Beer Fellows: SAVOR DC 2012: Beer puts on formalwear and steps out on the town. SAVOR DC 2012: Beer puts on formalwear and steps out on the town. These glasses await their destiny. Brewers and beer lovers descended on the National Buidling Museum in Washington DC for a celebration of beer and food over the evenings of June 8-9. Welcome to SAVOR 2012. Under the Roman arches and Corinthian pillars in the Great Hall, craft brewers from across the United States served up top notch beer paired with a cornucopia of foods. Styles of beer ranged across the spectrum from Black IPA to Imperial Stout, Rye Saison to Berliner Weisse. Food pairings were just as diverse with small plates ranging from lobster pot stickers and braised goat to S'mores and cornbread cobbler. 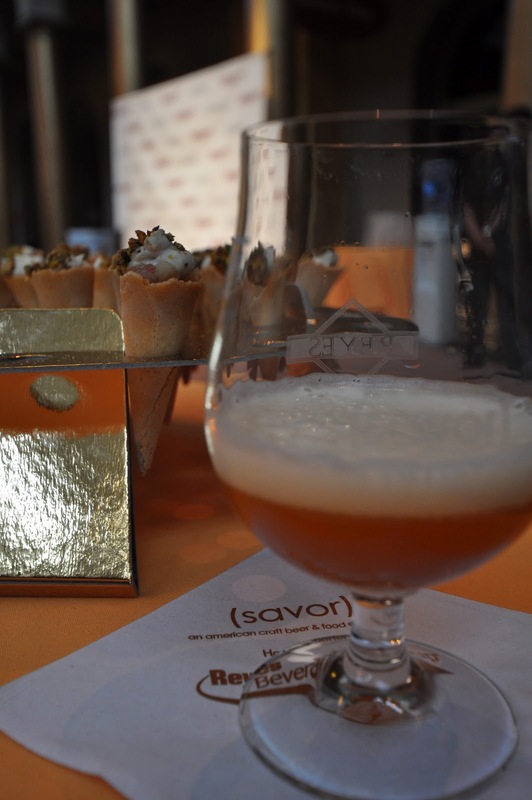 The name of the game for SAVOR DC is quality beer paired up with an assortment of small plates. All the beers were tied to a particular style of food meant to amplify each other and bring out the best of both. An example of this is would be an espresso stout paired with red velvet cake, or a porter paired with salt cod fritters. It is pretty safe to say there was something for everyone. Much like the variety in the food and beer, the brewers also reflected the diversity of the craft beer community in the United States. Young and old, big and small, the breweries included such large stalwarts such as Sierra Nevada and Sam Adams ranging down to small brewpubs like Vintage 50 and Magnolia Gastropub. Representation came from across the country too such as Surly Brewing hailing from Minnesota or Uinta Brewing from Utah, to locals brewers from the DC metro region, like newcomers DC Brau and Port City. For all the brewers SAVOR DC is a chance to share their passion for making good beer with an appreciative audience. Tim Surprise, founder of Arcadia Ales, said, "I'd like people to be titillated enough that our beers began the journey for them to not only become a fan of our beer but to discover something that resonates their interest in beer and food for the long term. For other breweries SAVOR DC offered a chance to educate and inform the attendees that great beer can be found across the country. Paul Kavulak, founder of Nebraska Brewing Company, said, "We already have great beer in the Midwest, but Nebraska hasn't really been known as a great craft beer state, I'm hoping people leave understanding that good beer can come out of there too." Kavulak brought his gold medal winning (and delicious) Melange A Trois chardonnay barrel aged Belgian strong ale to back up his statement. While there was no official dress code, people dressed in what made them comfortable, ranging from suits and evening gowns to a few t-shirts and bluejeans. Overall though that really didn't matter. What was more important was to be part of veritable smorgasbord of delicious food and drink with like minded people. There was a very cordial atmosphere over the whole event with folks mingling with each other, writing up their own tasting notes, sharing recommendations and moving from station to station looking for their favorites brews or that next something special. Brewers took the time to talk with guests, explaining their beer and brewing techniques between keeping tasting glasses refreshed. Lines moved quickly at the various beer stations and food stations stayed pretty well stocked. Only once did I spy a station that ran empty, but that was remedied about a minute later. If there was a real wait is was for freshly shucked oysters but even there the folks many that both worked their knives with deft assurance. Overall the event was well run with excellent support from the wait staff, security, and the volunteers. Here is where I would interject a word of caution though, while SAVOR is a a worthy celebration of craft beer, we still need to continue to make beer approachable and enjoyable. In other words we don't walk down the path to beer snobbery and elitism because at the end of that is place where we will all lose. At the same time though a great counterpoint was made by Kristi Griner, head brewster at Vintage 50 stated it best, "We are still introducing a new crowd to the joy of craft beer and bringing them over to our side, while some of these beers may be unique to some people, for others these are their local breweries and are places they go to enjoy great beer." My mother hennish thoughts aside, SAVOR is an excellent and worthwhile event that any food or beer loving person should highly consider attending. You will not be disappointed. Sounds like a great event, I will have to save up for tickets for next years event. It is was a very cool time. I'll be posting more pictures later this week once I finish doing some editing.